Vague Victoriana: Did Sarah and Gabriel Crisman Think of This? This is a guest post by Sara Stewart, one of my closest friends, an experienced costumer herself, and in general one of the best people I could possibly think of to understand and articulate the troublesome dynamics of the Crisman kerfuffle. I bow to nearly nobody in my appreciation of the Victorian aesthetic. I live in an Edwardian house; my bedroom features crewel curtains, a Tiffany-style glass-shaded lamp, bedding that looks like blue transferware, and an amazing embroidered textile piece I brought all the way from Jerusalem. I own fountain pens. I have a collection of Blue Willow china. I don’t, however, go so far as the Crismans, who have become suddenly internet-notorious for the article Sarah Crisman got published on Vox, I love the Victorian era. So I decided to live in it.” I don’t eschew modern refrigeration (because I have better things to do with my time than tempt food poisoning), or modern lighting. In fact, I think some of the things the Crismans are doing are downright dangerous, and I’ll tell you why. My first job out of university was writing course material for a systems safety course in occupational health, safety, and environmental processes. (I worked on Accident Causation and Investigation, Risk Assessment, and Approaches to Safety Management, among other things.) I was active in the Society for Creative Anachronism for over a decade, and trained in costuming with a woman who has a Master’s certificate from the International Costumer’s Guild. I routinely wear long skirts. I have a physical disability, so I am acutely aware of movement and mobility constraints. I’ve also spent much of my career looking at usability and human factors. While modern dyes and chemistry are allowing the Crismans to avoid the dangers of arsenic and picric acid dyes, uranium glazes, and mercury-laced millinery (and if she’s smart, possibly-explosive celluloid hair combs), they’re still opening themselves to quite a bit of — in my opinion — unnecessary danger. Vicky Holmes, a researcher from the University of Essex in England, has done a series of posts dealing with the dangers of Victorian stairs. I can also imagine that someone unused to navigating Victorian stairs in Victorian shoes and clothes might have more trouble than born-and-raised Victorians, however. One area where I do see the Crismans wandering into a lot of danger is lighting and heating, though. While Holmes does not document a lot of deaths by candle, she also shows that Victorians often used candle guards, which I notice are conspicuously absent in the picture we’re given of the Chrisman home. I was also personally quite nervous to see a picture of Sarah Crisman lighting a kerosene heater that is simply set out in the middle of a rug, in the middle of what looks to be a fairly cluttered room. As Anne Kingston wrote in her reporting for Mclean’s on the Bata Museum’s exhibit of deadly Victorian fashion, “‘Crinoline fires’ killed 3,000 women between the late 1850s and late 1860s in England. Women would lose sense of their circumference, step too close to a fire grate, then flames would be fanned by oxygen circulating under their skirts.” Is Crisman really so sure that her “cat-whisker” skirt-sense is so good she’ll never get too close to that kerosene heater? Or that she’ll never get her sleeve too close to one of those candles, or tip over an oil lamp onto herself? 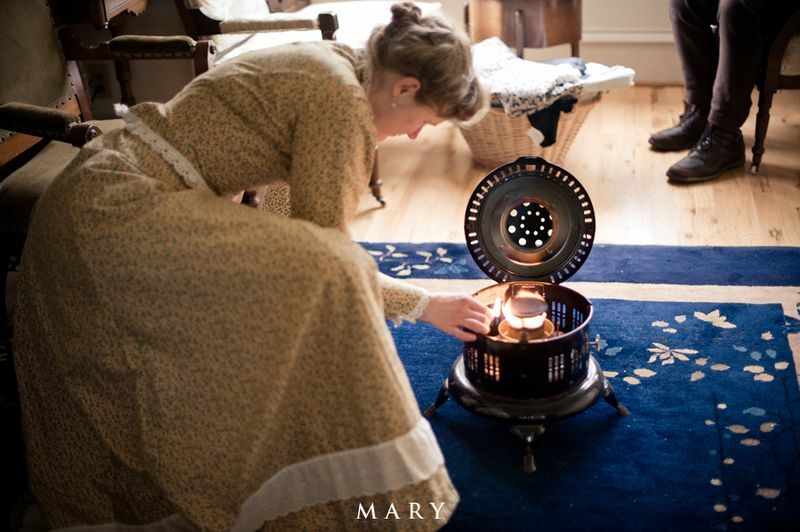 (One of the perils of restrictive Victorian clothing is also that it makes it harder to “Stop, Drop, and Roll.”) Or step too close to the fender with the fire going? An accident of a deplorable character occurred on Friday night at Day’s Crystal Palace Concert Hall, Smallbrook Street. About a quarter to eleven, when the ballet scene, and when the whole of the ballet girls were on the stage, one of them named Fanny Smith, struck with a wand the wick of a lamp which was fixed on a pedestal about seven feet high. A portion of the wick, saturated with spirits of wine, fell upon her dress and it ignited directly, and in a moment she was enveloped in flames. 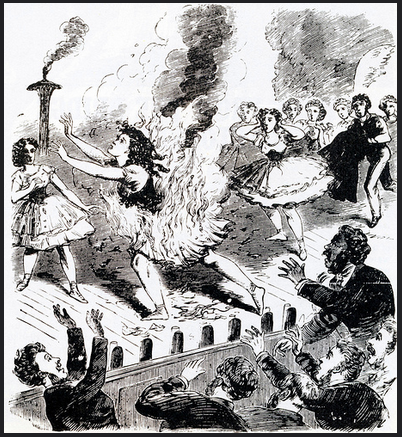 She rushed on the stage and then off, and then on again, and was at length rolled in a man’s coat, and the fire was extinguished, not until she was dreadfully, if not fatally burned all over the body. She was taken to the Oueen’s Hospital where she later died. That’s not counting the possibility of — of the things I can think of off the top — scalds from doing laundry, or burns from ironing with a real Victorian iron (literally just a block of iron with a handle on it that was heated in the fire), or chimney fires, slips and falls on carpets, or slippery hardwood floors (that particular Victorian hazard cost me, personally, a broken tailbone, a broken collarbone, and a rotator cuff injury that bothers me intermittently to this day, nearly a decade later). I’d also be interested to see how they handle winter weather in Victorian shoes. Speaking of which, Sarah Crisman never mentioned her shoes. What kind of shoes is she wearing? While I do appreciate the value of actually living history to gain insight into the practical techniques of daily life in the past, I also think there is such a thing as taking it too far. I used to at least return to normal life after weekends (or two-week vacations) spent in the New Middle Ages, after all. And, as Creative Anachronists, we are allowed to opt out of the really dangerous stuff if we so choose (and most of us do). On the other hand, doing it full-on and then complaining that people aren’t nice because they think you’re weird is really self-victimising, and seemingly ignoring genuine hazards out of either ignorance or the false assurance that it couldn’t happen to you is just begging for more of the same. I note they are childfree. So many conveniences they eschew were created to enhance the safety of households with children (so many accounts of fires and burns caused by the immature motor skills of young children combined with flame heat and light) and to ease the burdens of working-class and lower middle-class women who had to manage food and clothing for their families. Funny to think of a dishwasher or a fridge as a feminist choice (especially when I consider the pink appliance suites advertised for Mothers’ Day in the 1950s), and I have lived without both. Abut I sure do appreciate them when I am trying to move children thought their paces and feed us and engage them in cleanup at the end of a workday. Things are seldom (only) what they seem. We are a profligate people.